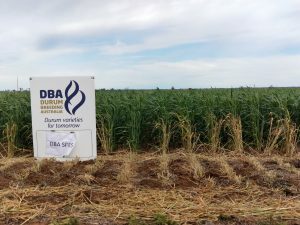 The announcement and details of the new durum variety currently known as UAD154192 will be released and orders will be offered to growers at the spring cropwalks to be held at Roseworthy, September 5 and Wolseley October 10. 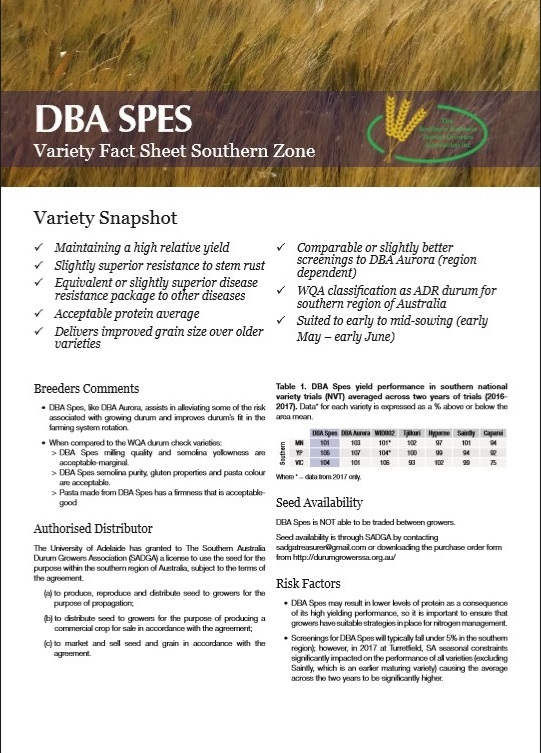 Seed will be strictly limited at the end of this season, although seed for DBA Aurora will still be available from SADGA if any grower misses out on the opportunity to evaluate UAD154192 in 2019. The best brains in the business will come together both days and will cover off on the research and what the trials have revealed since their commencement. 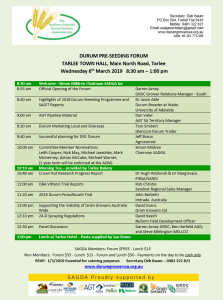 Topics and trials to be discussed will be include crown rot, Nitrogen Use efficiency, application of chemicals such as Sakura and other new chemical formulations, sodic soils, and drones just to mention a few. 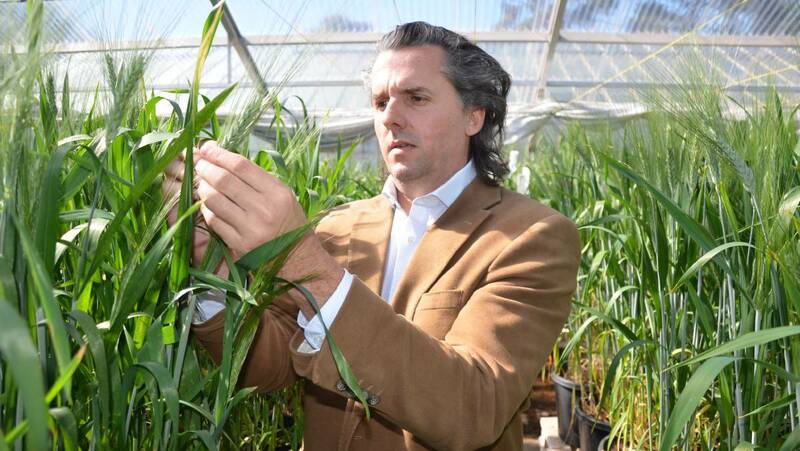 “One of the highlights of the cropwalks this year will be the official release and naming of our newest durum variety” says Dr Jason Able durum breeder and Associate Professor for the School of Agriculture, Food and Wine at the University of Adelaide. 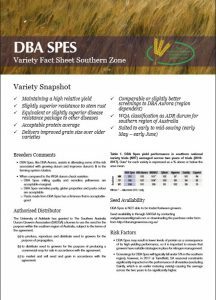 As part of the release, Jason will highlight the pros and cons of this variety over other commercially available durum varieties such as DBA Aurora and Saintly. University of Adelaide researchers Dr Rhiannon Schilling, Dr Delphine Fleury and Dr Melissa Garcia will also be advising growers at Roseworthy of trial data and research discoveries from the GRDC Sodic Soils project as well as giving an update to the ARC Industrial Wheat Hub research that is currently being conducted. The advancements in technology in the field of agriculture are numerous and the SAGIT Drone project is bringing forward new data that will help with future farm application and productity decisions. 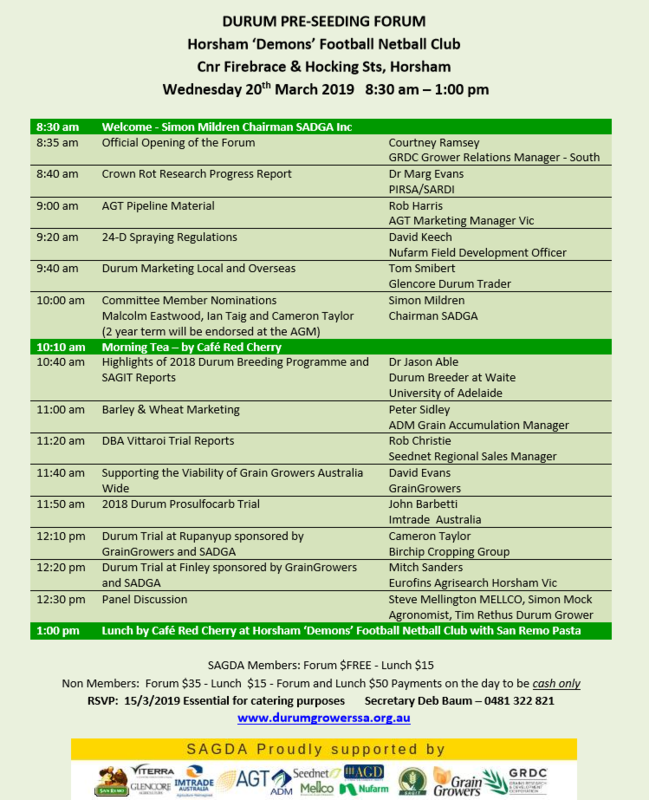 Sam Deed also from the University of Adelaide will be providing an update on the SAGIT Nitrogen Use Efficiency trials and research work that is underway at the Waite Campus. 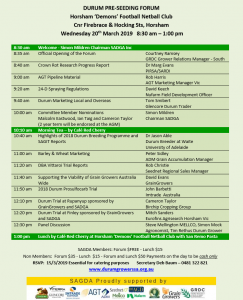 Drs Marg Evans and Hugh Wallwork of SARDI will also be on site showing growers the research trials and answering questions about crown rot and other diseases. 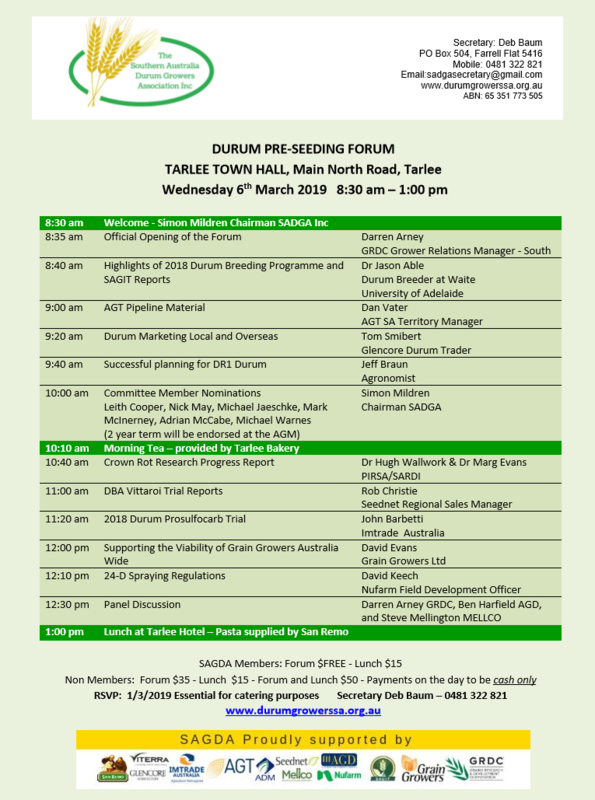 “The SADGA committee are looking forward to catching up with growers interested in incorporating Durum into their rotation and attendees are welcome to join the committee for lunch at both locations”, invites Simon Mildren SAGDA’s newly appointed Chairman. 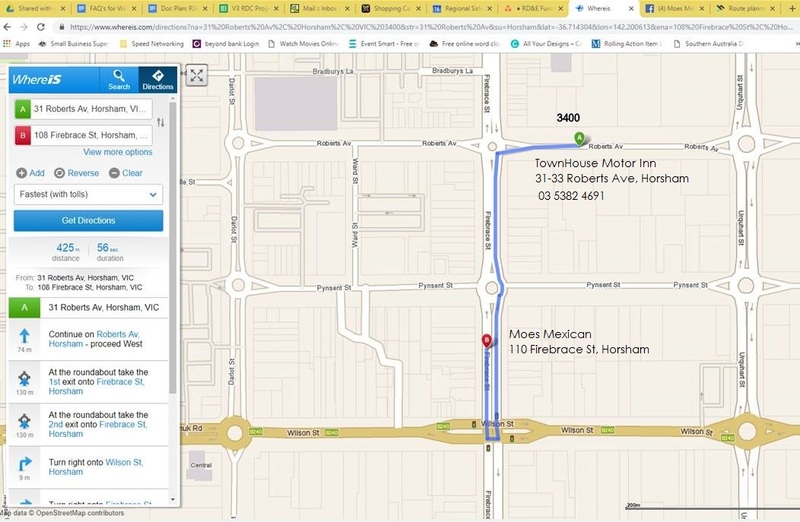 Click here for Map 3 for Sites 3, 4 5 & 6 Uni Adelaide Kaniva Trial Site for Nufarm & Sakura Trials, NVT Trial Site, New Variety Site and BBQ at Alwyn & Kerryn Dyer. This entry was posted in Uncategorized on August 27, 2018 by Deb Baum. 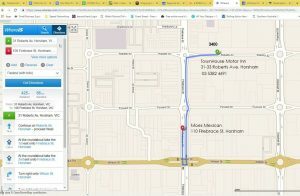 Sept 5th for the research areas for South Australian Mid North Lunch to follow at the Roseworthy Pub (meals at own cost). 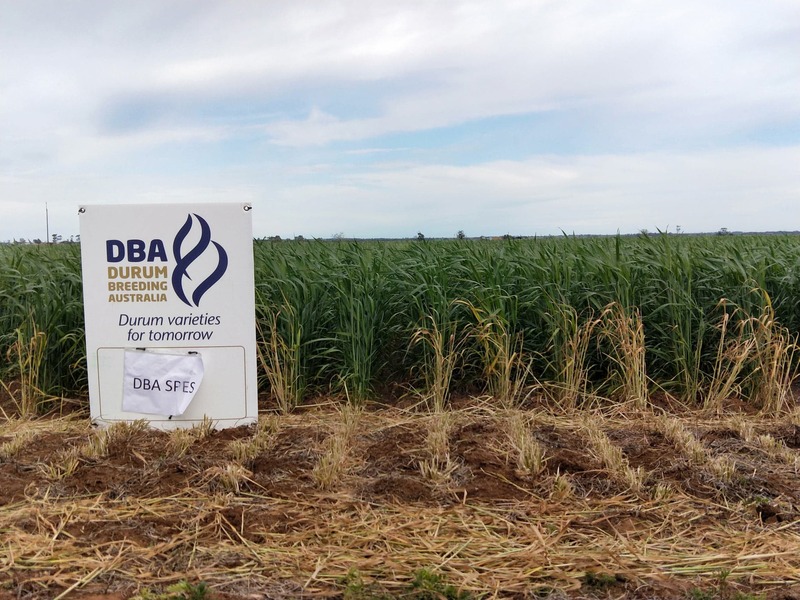 Oct 10th for the research areas of the south east South Australia and West Wimmera with BBQ tea at the Dyers following the cropwalk. Its looking less likely that Deb will bring the rain so she’ll be lassooing a cloud and taking it back with her!! This entry was posted in Uncategorized on July 9, 2018 by Deb Baum.